Yoga in Kerala tour is a hidden immersion to the state's healing and wellness prowess. With its balmy and eco-friendly environs and serene setting, Kerala forms a great backdrop for healing sciences, including Ayurveda, Yoga and other wellness therapies. From Kochi, the spice hub of Kerala, travellers will be transported to the eco-friendly resort at Marari beach, which will serve as the yoga center for the entire tour. Upon arrival at Kochi, meet Incredible India Tour representative for assisted pick up and transfer to an eco-friendly luxury beach resort in Marari. (1.5 hrs) Upon arrival, check in the resort here. After settling here, meet Ayurveda Physician here who will determine the traveller's body constitution and recommend the diet and yoga postures during the trip accordingly. This eco-friendly resort has a Green Lead Certified Ayurvedic Center wherein massages and treatments can also be availed. Post the consultation session, book the appointment for recommended massage/treatments during the stay here. In the evening, unleash the opportunity to spot on the magical sunset on the Keralan beach. Later this evening, enjoy a cultural performance over dinner. Begin an early day for the scheduled meet with the Yoga teacher and practice 'asanas' or postures. Post breakfast; discover more about the conventional & scientific aspects of Yoga, the various types of 'pranayama' breathing patterns and their benefits, followed by an interactive Question & Answer session. In the afternoon, begin an eco-tour of the resort with the resident naturalist here. After the leisurely evening, begin a yoga practice session and enjoy relaxed time on the beach. Dinner and overnight in the resort. After an early morning Yoga session, begin the butterfly garden tour inside the resort with the company of the learned resident naturalist. Post breakfast session, learn about the history of yoga and Sage Patanjali's Yoga Sutras. He organized the different aspects of yoga in 'Yoga Sutra.' Followed by this is the 'pranayama' (breathing), meditation and Question-Answer session on yoga. Post lunch, time is free at leisure. After the evening yoga practice and meditation session, enjoy the relaxed time on the beach. Dinner and overnight in resort. After an early morning Yoga session and breakfast, begin a guided local Hindu temple tour, where the guide will interpret the importance of religious and architectural elements involved in Keralan temple building. Return to the resort for a relaxed afternoon and lunch. In the evening, undergo the periodic Yoga theory session followed by practical asanas, 'pranayama' (breathing), meditation. Enjoy a relaxed evening. Dinner and overnight in resort. 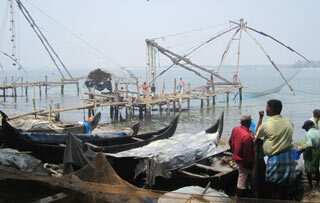 After an early morning Yoga practice, experience the local Kerala life and livelihood by visiting a fishing village. Here, the fishermen take their boats to the sea and bring it back with their prized catch i.e. fishes in the traditional way. Return to the resort for breakfast. As per the schedule, learn about Kundalini Yoga to activate life's energy and practice the postures and exercises during the post breakfast morning session. Post lunch session, begin Meditation practice in the evening. Dinner and overnight in resort. After an early morning Yoga session and breakfast, a mantra chanting session followed by its benefits and interactive discussion is scheduled. Meet the Yoga Guide in peace before heading towards the luxurious houseboat in Alleppey. Here, cruise through the placid backwaters, which are an iconic attraction of Kerala and enjoy lunch onboard. Evening is free for local sightseeing inclusive of Chinese fishing nets and local shopping. Dinner outside before returning to the resort for overnight stay. Participate in the farewell morning Yoga session or enjoy a relaxed morning on the beach. Checkout and drive to Kochi airport for journey to onward destination.